Awhile ago we looked at The Monster Engine, where Dave Devries turns childrens' drawings of fantastical monsters into professional renderings of the very same beasts. If you haven't checked it out, it's pretty cool, and a great simple idea worth repeating. 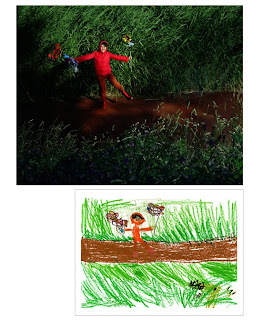 Yesterday Very Short List blasted about Yeedoo Jung who in 2005 took childrens' drawings and turned them into professionally render photographs akin to movie sets. They are pretty cool too. Check them out here. It's great how good ideas are never held by one person alone, but that all over the globe people are thinking the same thing, only a wee bit different.